The Darwin Rollergirls is a non-profit organization that is self-governed and dedicated to making a positive impact in the lives of our skaters and community by operating a women's flat track roller derby league. We strive to advance our organization by encouraging teamwork, dedication, and cultivating the individual talents and strengths of all of our members. We are committed to promoting athleticism while maintaining the sense of fun and individuality that roller derby represents. HIGHWAY TO ROLL! OCTOBER BOUT. The Battle between the Northern Territory's first Two Roller Derby Leagues is here!! 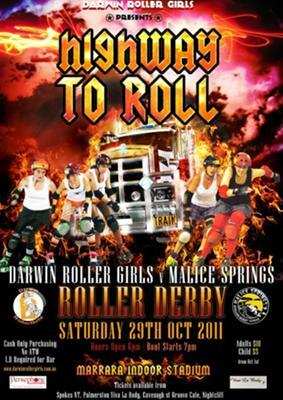 Malice Springs Roller Derby League are on a 'Highway to Roll' as they travel to clash with the Darwin Roller Girls in a head-to-head battle on wheels. There will be THRILLS....there will be SPILLS....both teams will most certainly bring the pain in a 'No Love' showdown for the honour of THE FIRST ROLLER DERBY VICTORY N.T! This is a Bout not to be missed, so get your tickets, fire up and GET YOUR ROLL ON! Bring the family, bring your mates but get in quick because the stadium has limited seating! If you're out of town, send email to drgmediamanager@hotmail.com and you will be hooked up! DO NOT RELY ON DOOR SALES, THERE MAY BE SOME BUT PLEASE PRE-PURCHASE AND SECURE YOUR SEAT. Support YOUR Local Roller Derby League!